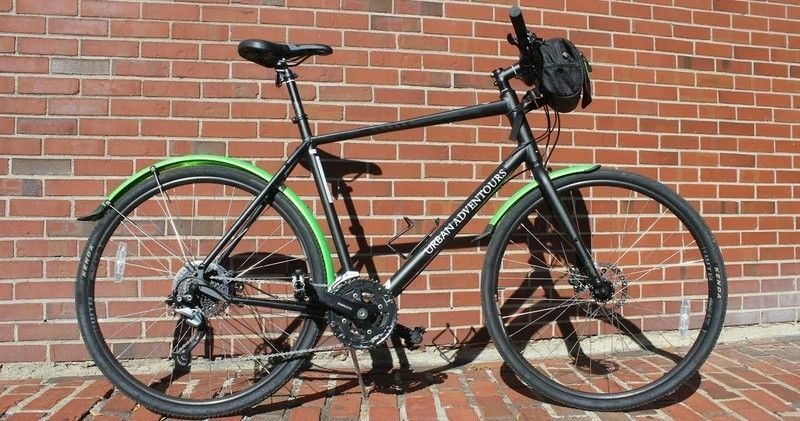 Used bike, labeled "Urban Adventours" along bars, has a few small Red Sox stickers on frame, has bright green shields over both tires, lightweight aluminum frame. It is from a Boston bike shop, so it is probably the ONLY one in Chicago. It was locked behind my building in a locked, gated area. It was locked here for two weeks. I went away for a couple of weeks to return and find my bike missing. The lock was completely intact and left on the fence, still locked. I am unsure how this could have occurred. The building said they did not remove any bikes. Perhaps it was taken apart.